Doctor Who: Was Series 7 Matt Smith's Best? Series 7 ushered in the 50th year of Doctor Who's life and was promised to the viewing audiences as being well worthy of the legacy. Jenna Louise Coleman and Matt Smith paired up in a newly refurbished set of The Doctor's ancient home, their episodes ushered in with a new title sequence and theme. 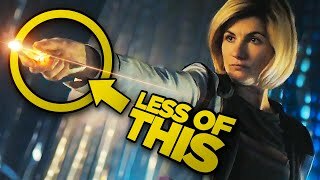 What's more Series 7 saw the departure of the longest serving modern companion Amy Pond and possibly too the longest serving recurring character River Song. But did the Series live up to the hype? Was it wonderful, a mixed bag or no good at all? Regular WhatCulture! contributor Stephen Higham and his friend Tom Bird take a look back at the series to try to answer these questions. If you enjoyed this nonsense you might also enjoy much longer conversations, sketches and web-series from Stephen and Tom HERE. Whilst not writing articles for WhatCulture! Stephen can usually be found livin' it up in the city or livin' it down on the couch in front of one of many DVDs. You can tell how many of his friends are in Edinburgh at any given time by measuring how prolific he is on this site.